Patient-reported outcomes (PROs) are the gold standard to describe subjective symptoms. Nurses can be successfully involved in collecting symptom information, because of their direct relationship with the patient. In order to improve clinical management of outpatients receiving active anti-cancer treatment, we introduced in routine clinical practice an assessment of patient-reported symptoms and toxicities, starting from January 2018. Our hypothesis was that this could help to better control symptoms, improving patients’ quality of life (QoL). Eligible patients were receiving an active anti-cancer treatment, as outpatients. Patients included in the control group (treated in 2017) underwent “usual” visits (group A), while patients treated in 2018, before each visit received a questionnaire by a dedicated nurse, in order to provide information about symptoms and toxicities (group B). Primary objective was the comparison of QoL changes, measured by EORTC QLQ-C30. A total of 211 patients have been analyzed (119 group A; 92 group B). After 1 month, mean change from baseline of global QoL was − 1.68 in group A and + 2.54 in group B (p = 0.004, effect size 0.20). Group B showed significantly better mean changes for fatigue, pain, and appetite loss. Proportion of patients obtaining a clinically significant improvement in global QoL score was higher in group B (32.6%) compared to group A (19.3%, p = 0.04). Patients’ satisfaction with questionnaire was high. Introduction of PROs in clinical practice, thanks to an active role of nurses, was feasible, produced high patients’ satisfaction and a significant QoL improvement, compared to the traditional modality of visit. The online version of this article ( https://doi.org/10.1007/s00520-019-04777-2) contains supplementary material, which is available to authorized users. The authors wish to thank all the patients who were included in the analysis, and their caregivers. 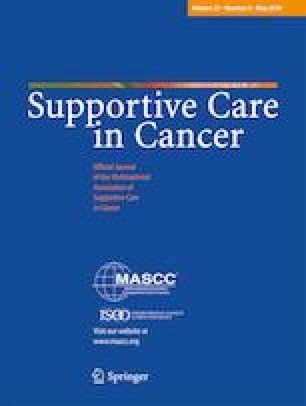 Massimo Di Maio is recipient of a research funding from the CRT Foundation (Turin, Italy) for this project on the impact on quality of life of the systematic evaluation of toxicity with patient-reported outcomes in patients with solid cancer (CRT grant number 46333, “Richieste ordinarie 2015”). This research funding allowed the attendance of Chiara Baratelli, Carmela Giovanna Cleopatra Turco and Donatella Marino at Ordine Mauriziano Hospital. We state that there are no conflict of interest do declare. We have full control of all primary data and we agree to allow the journal to review our data if requested.